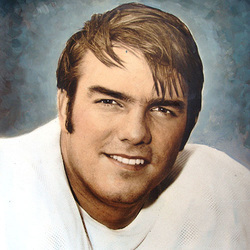 A 1969 Honorable mention as All American, Tony and Ted Hendricks played as bookends for the Hurricanes on the defensive line and caused havoc for opposing quarterbacks and running backs. Tony played in the North-South and American Bowl All-Star games and was invited to the East-West All-Star game. A three-year letterman at Miami, he was tapped into Iron Arrow, the highest honor one can attain at the University of Miami. Tony was drafted in the 4th round of the 1970 NFL draft by the Oakland Raiders. He was named to the NFL All-Pro Rookie Team. He played professional football in the National Football League (NFL) for the Oakland Raiders from 1970 to 1975 and the San Francisco 49ers from 1976 to 1977. Some researchers claim that he holds the American Football Conference (AFC) rookie sack record with 17½ in 1970, but as the NFL has only recognized the sack as an official statistic since 1982 and as a result his record is unofficial. ​Sadly, Tony Cline passed away on July 21, 2018.